These are Pumpkin Muffins with Cream Cheese frosting. I got the recipe for these from the Renaissance Woman. Except R.W. doesn't frost hers. I'm bad. I tell myself that since I'm eating all that healthy beta carotene, a little cream cheese frosting can't hurt. These muffins are so easy to make, and so evil, that you will be cursing me for sharing the recipe with you. But look, you can get a Box Top from the can of frosting! You might not care about that Box Top once you realize that you can't stop eating these dang muffins. And here we are heading into the season of 18,000 calorie days. Mmmmm, I love pumpkin!! Those look sooo evil!! Your recipe cards are so cute, what a great idea! Oh my. Pumpkin. Drat, now I have to add cake mix to my shopping list this week. Thanks, I think, I can't wait to try these. I sorta have a thing about pumpkin ... like, I can't stop eating anything with pumpkin in them! Those look and sound sooooo yummy! I have everything here to make them too. Ooo...bad thing. I will end up eating them all myself. Yikes! I wonder if they will freeze if I don't ice them. Hmm...must try. Thanks for sharing! This looks so yum! I will try it out this afternoon. That is really yummy!! 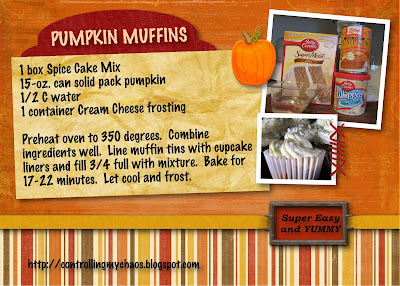 I am posting my Pumpkin Gingerbread Cupcakes tomorrow so watch for that.